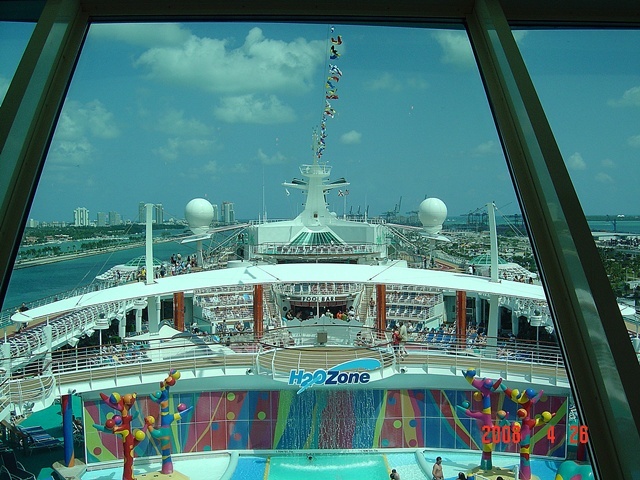 An Eastern Caribbean Cruise on Freedom's sister! After so many cruises, it's tough to keep saying, "This was the best cruise..." without sounding repetitious. 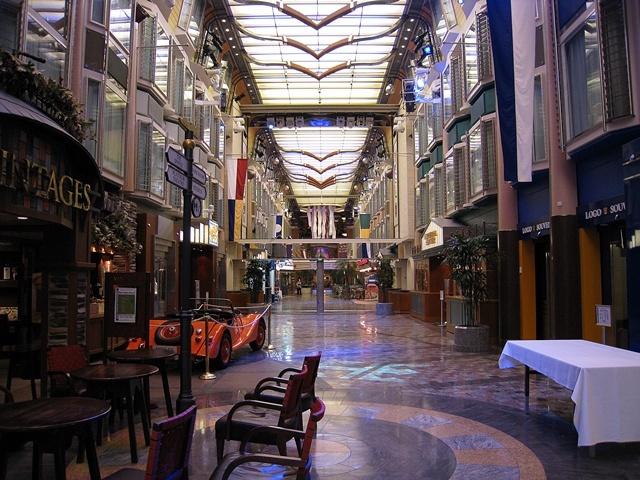 But they do seem to just get better and better and Royal Caribbean's Liberty of the Seas continued that tradition! This was -by far- the best cruise we've ever been on and is now the one that all other cruises must measure up to. I’ve since talked to one of the more seasoned RC cruisers, and he assured me that of his over 100 cruises with RC, the Liberty is his favorite ship! 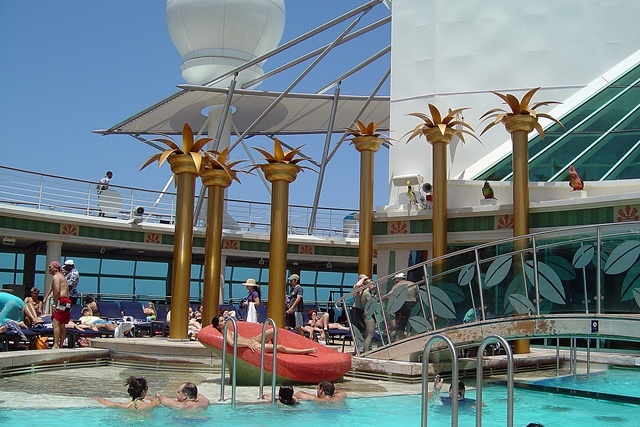 After all this, we donned our swim suits and headed to some of the empty pool spots (attention cruise virgins... take your swim trunks in a carry on so you can enjoy your cruise immediately!) to enjoy them and wait for the perfunctory and perfectly sensible "muster drill". It's a great idea to know where your lifeboat is aboard ship in the extremely unlikely event of an emergency. We had a tame lot for this drill and it seemed to be done and over much more quickly than I ever remember it being before. 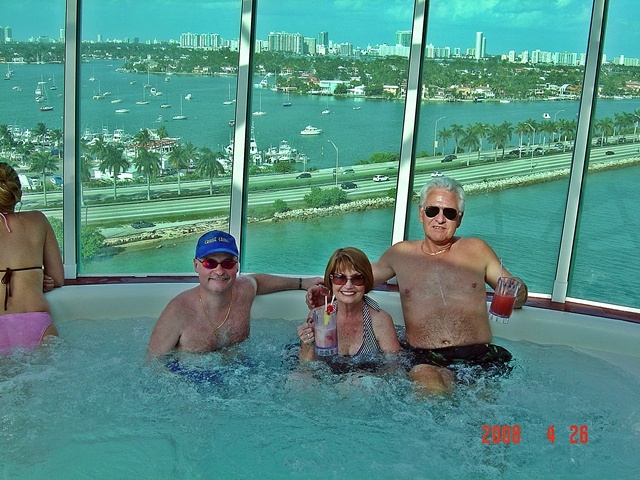 After the drill, we headed up to the port side cantilevered hot tub and watched the departure from Miami. Passing the mansions and South beach's towers is always so much fun. The cruise begins! Drinks in hand, we set sail! (L-R: Me, Pat and Mac) View from cantilevered hot tub! Sunday, April 27th: Our first day at sea began with a massage for each of us. Although I was originally assigned a woman named Tess, apparently they had overbooked and I was reassigned Harry... a masseuse who also is the ship's acupuncture therapist. I only cared about whether he gave a great massage or not, and he did, although it was more of a pressure point sort of massage. Still, massage is always a great way to start a cruise. Some of my shirts, and my suit coat got wrinkled despite my efforts to keep this from happening, along with some of Diane's things. On Saturday, we shipped them off to the ship's drycleaners for pressing with guaranteed next day delivery (at a ridiculously cheap rate). This was important as tonight would be the Liberty's first formal night, and I needed that coat. Sure enough all the clothes were ready and delivered back to our stateroom by 4pm. Excellent service! We lunched in Johnny Rockets... I always go to these for the malted milkshakes, the mounds of fries and onion rings and for the floor shows. The burgers are generally lousy at JR's (different with each RCCL ship that has them), but Liberty's were okay (I guess this is high praise from me for a Johnny Rockets... if only the had a Five Guys aboard instead!). I find this to be true at the landside JR's as well that I've visited in places such as Las Vegas. Our coupon book always has a coupon to cover the "cover" charge to get in here. So we always make at least one lunch stop. Oddly, for a day at Sea, JR's wasn't crammed with passengers. We walked right in and sat right down. I was astonished. 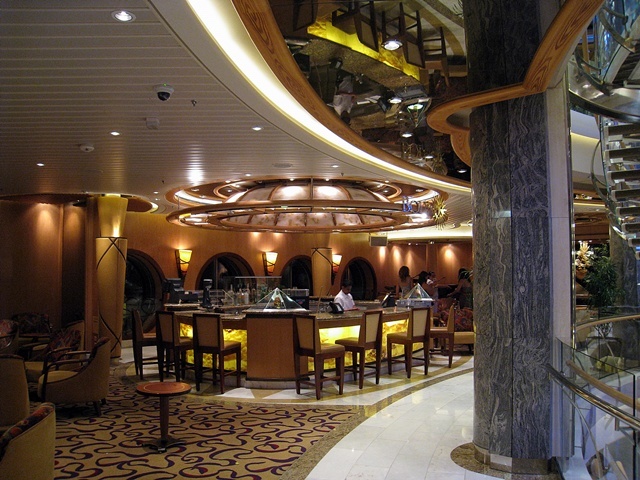 (If you're ever on a Radiance class ship, you'll find a burger/sandwich area in a similar location but not a JR's. Anyway, they offer much better food.. but without the fun floor show. So don't miss this location on the Radiance class ships) We all enjoyed the production show, “Somewhere in Time” in the main theater. 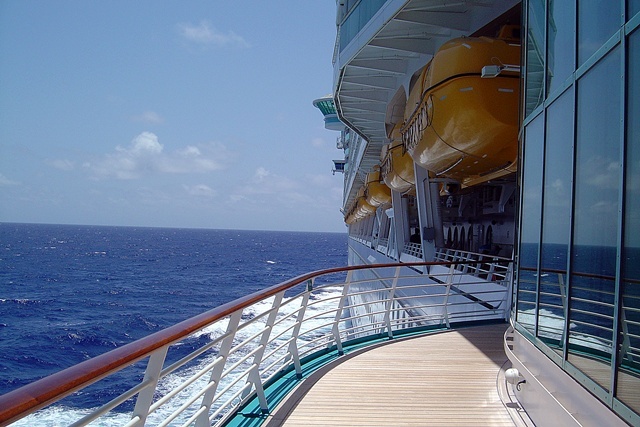 Strolling the wrap-around promenade while at sea! Monday, April 28th: Our second day was half at sea and half at Puerto Rico. (Arrival at 3pm and departure at 10pm) Since we've been to PR so many times, we generally like to stay aboard the "abandoned" ship and have it all to ourselves (save a few others that we "allow aboard our private super-yacht"). I think we started this day (it was one of them) with breakfast delivered to our cabin... and boy oh boy, were they on time with the delivery! We asked for a 9:30 am delivery and the phone rang at 9:25 am with them informing us that the food would be there shortly. (the last time we did this on a cruise, breakfast was half an hour late) We ordered two plates with two eggs and hash browns and two pastries and orange juice and one plate with bacon as well. (I hate bacon) The ordering form for room service is a card you fill out and leave on the outside of your cabin door by 3 am the night before. Anyone ordering from this menu card will see that it can be a bit confusing in it's wording... and to our amusement, everything we ordered did arrive hot and ready to go... but in interesting quantities that said I'm going to have to take a better look at the card next time. We got four plates, each containing 1 (one) scrambled egg and bacon and a hash brown and two plates of pastries (yum!) and 3 glasses of orange juice. I wondered why the delivery guy had such a curious look on his face... and immediately knew why when I lifted the plate covers after he left to discover all this spread. He probably wondered why we wanted four plates with such meager amounts on each since there were only the two of us! We laughed about this and dished things out the way we intended and went out to the balcony to eat. It was wonderful! (Save for the copious amounts of bacon... we tried as best we could to give it to Pat and Mac in the cabin adjacent to ours, but they weren't interested. I coughed some of it down as I hate to waste food... but I truly hate bacon). The rest of the day was spent with Pat and Mac and Dad and us forming our own private alcove with seats in the Solarium looking out at the port in Old San Juan and watching Carnival Liberty pull into port. That night we all got dressed up in our finest formal wear and had a great dinner followed by a spectacular show. Chops Grill called and said they could take us this night, but since it was formal night, our gang wanted to be in the main dining room. The staff assured us that they'd still try for our original request for Tuesday night instead. This night, we saw the most spectacular production show ever, “In the Air” where the performers actually flew above the stage!!! We’ve seen one or two fly before, but never so many as in tonight’s performance. An incredible experience! Tuesday, April 29th: Our third day found us in our most favorite Caribbean beach spot: St. Martin! (Update 2009: no longer our favorite, but a close second! We now actually think of Trunk Bay in St. John in the American Virgin Islands as our favorite beach spot!) We normally get off the ship as early as possible here and get a taxi directly to Orient Bay and stay at one of the middle sections of this long and beautiful arc of gorgeous beach. La Playa Beach is our favorite area at Orient Bay. Unfortunately, on this day, the Dutch side of the island was celebrating Carnivale and all businesses were shutting down at 2 pm. Therefore, we were warned that any "on your own" trips to the French side might get bogged down in traffic jams due to people reveling on the Dutch side which could cause us to miss the ship's departure. This is every cruiser's nightmare. So we scrambled to find a RCCL side trip. So did everyone else. 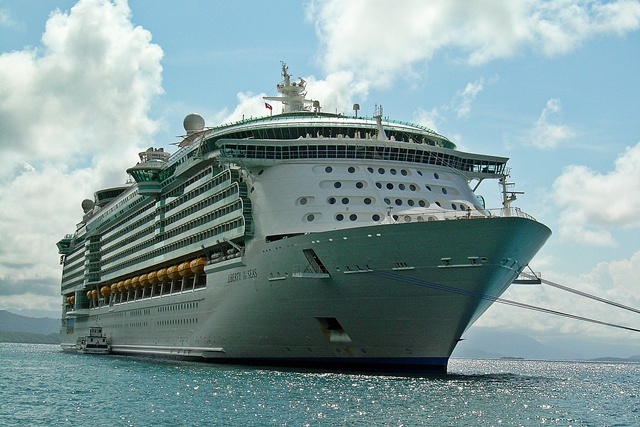 (Hey, if Royal Caribbean sends you on a trip, they'll be darned sure to get you back before the ship leaves!) The only trip open was a trip to a Butterfly Farm (uh... OK) and a Beach Break at Orient Bay (hooray!). Kathy, Linda and Nanette had already signed up for this tour, so we joined them. The Butterfly Farm part of the tour was actually fun. 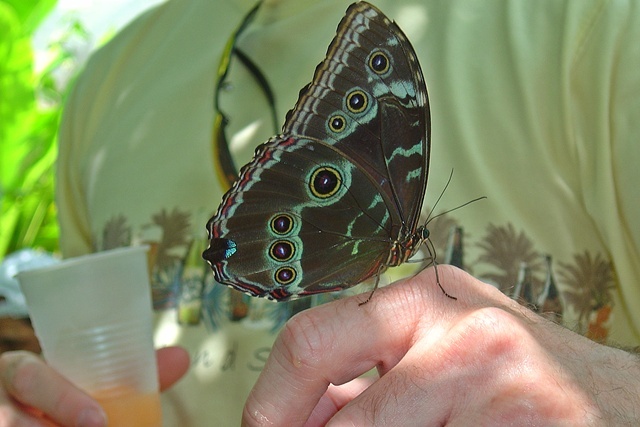 I had a large butterfly (wings were brilliant metallic blue on the inside) sipping rum punch off my hand (he flew very curiously after this). Teaching a beautiful butterfly to drink booze! They love it, actually! Next we were taken to Orient Bay. Unfortunately, this was at the far end of the arc of beach, directly opposite from the side of the arc where the nudist colony is located (note: all beaches on the French side are clothing optional). This section of beach was not the Orient Bay experience we knew... it was downright dirty with gobs of dead seaweed and nasty rocks and course sand and trash. Diane and I (and later Nanette and Linda) walked for about fifteen minutes down to a much nicer section of the beach. 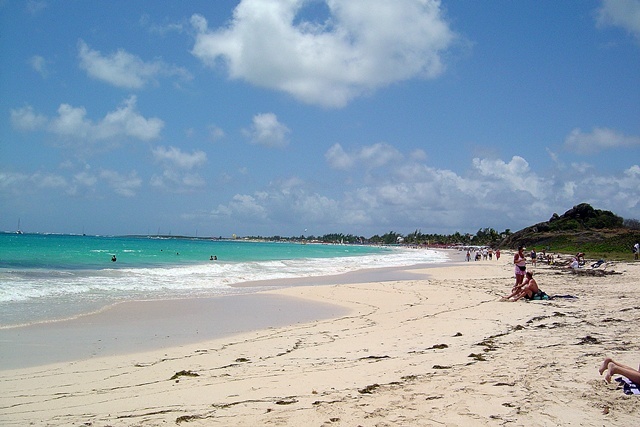 If you take this tour, I definitely recommend that the minute you get to the beach, hang a right and keep walking till you see powdery sand like flour and Caribbean blue crystal clear water and fun looking rentable chairs and umbrellas and restaurants and plop yourselves down at one of these many beaches. This is a must if this is your first trip to St. Martin. Don't let this dilapidated beach with its broken "free" chairs that this tour takes you to form your opinion of Orient Bay. All in all, it was a great beach day once we moved! Orient Bay is not to be missed on any itinerary with St. Martin in it! Later, we got back to the ship, got a quick lunch and ran back to the shops at the port. We ran into Pat and Mac who told us about a great Canon camera buy at Boolchand's in town and we decided to grab one for ourselves. (Our old Sony camera was really showing it's age) They pointed out that there was a Boolchand's right here at the dock so we ran in there and bought ours. What an incredible camera (the Powershot SD870 IS) at an incredible price. We found out that Dad bought one, too. Most of the shots on this page are taken with the old Sony camera, but the ones taken with the new Canon camera will be identified in the picture titles. All cruise reviews after this will feature photos taken with the Canon. 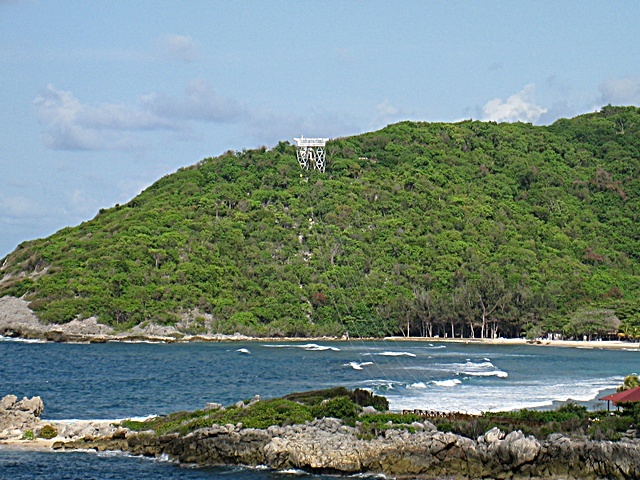 The section of Orient Bay that the Butterfly Tour takes you to as part of the tour. Walk to La Playa Beach about 15 minutes away for a much better beach location. When we got back to the ship, we found out that Chops had a table for five for us that evening. Hooray!!! We couldn't believe it. (The girls, Kathy and Nanette and Linda, also got a table the next night at Chops. So all of our original wait list requests were handled!) Dinner was phenomenal... the best aboard! The service was excellent, and the Chops Grill manager was effusive and giddy over how pleased she was to see my request granted. She kept visiting our table and telling us how much fun we were. She even gave us a little gift because I made her laugh. I don't know what it is, but the Chops Grill staff always seems to have tons of fun on all the ships we're on (a contrast to the staid and conservative Portofinos... my other favorite haunt). We gorged ourselves and went to a show. Life isn't just good! It's spectacular! 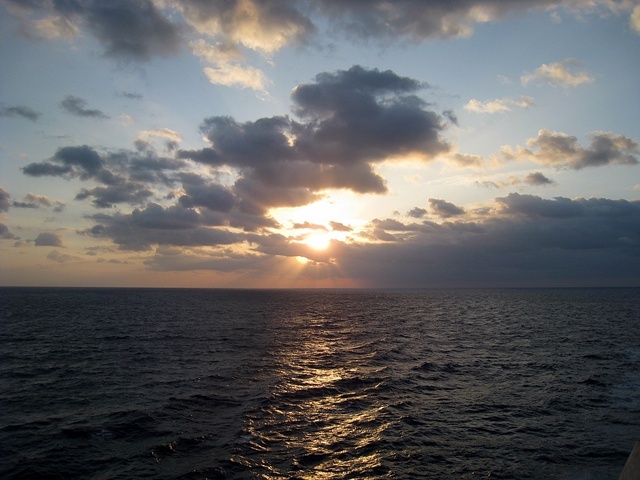 Wednesday, April 30th: Our fourth day was another splendid day “At Sea”. We mostly hung out at the casino (Patty and Diane tried their luck at the Blackjack tournament… but luck wasn’t on their side) and later we did lunch at the ever-popular Windjammer. Meals here were always delicious. We originally planned to eat lunch in the main dining room, but alas, it closes its doors at 1:30 pm. (An odd time for lunch to end) We decided that by hook or by crook we were going to definitely eat lunch in the main dining room before the end of the cruise. Later the rest of the gang enjoyed the ice show while I worked off a few ounces in the gym and enjoyed the spa facilities. Dinner this night was in the wonderful Portofino’s restaurant. Everyone has their favorite between Chops and Portofino’s… I just love them both and for completely different reasons. The meal at Portofino’s is 2.5 hours long because everything is prepared fresh. But there are no pauses in the constant stream of sumptuous dishes here. Don’t forget your appetite. Thursday, May 1st: Our fifth day was spent at the gorgeous Royal Caribbean retreat at Labadee (the ship’s captain kept saying, “Labadabadee!” sort of like Fred Flintstone saying, “Yabadabadoo!”... it was hilarious), Haiti. This section has beautiful mountain backdrops, wonderful beachs, three excellent BBQ lunch areas, restrooms, bars, kiddie water park... well, it has everything. The most exciting thing on this trip to Labadee was the new Dragon’s Breath Zip Line! Kathy, Nanette and Linda and I opted to do this... and if you’re ever at Labadee, I HIGHLY recommend the experience. There’s a short training course and a small “see if you like it” training zip line. Then it’s 500’ up above the water and a 2500’ ride along the crescent beach line over the sea and to the other side! What an exhilarating experience! The views alone of the tiny beach, and the Liberty off on the other side in the bay are worth the admission! Tonight’s show was “Ever After” another spectacular production! 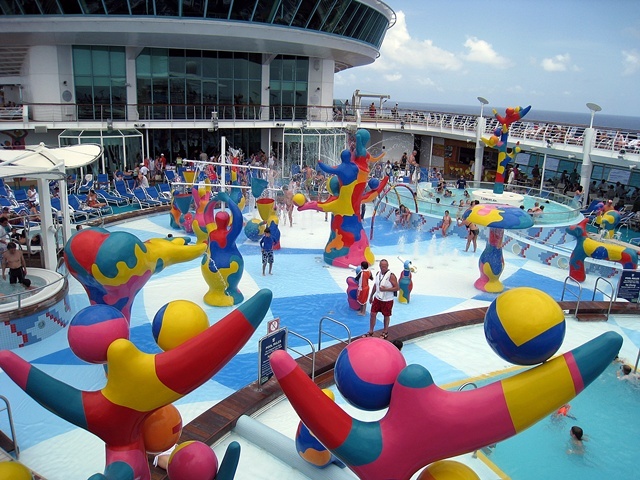 Wow, three live shows in one cruise… that’s a record! Our beach location is out of the picture on the right. 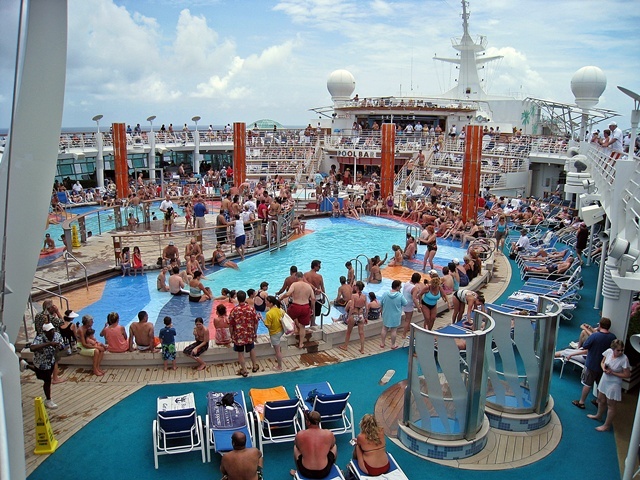 Friday, May 2nd: Our sixth and final day was one more wonderful day “At Sea”. We began the day by waking up at 6:15 am to watch the sunrise. Somehow we always plan to do this but we always sleep through the time rather than actually get ourselves out of bed. This time, we both threw on our Royal Caribbean robes and went out to the balcony. There, in the east, we could make out the sun as a growing pink glow that eventually broke through the clouds and lit the sea with deep golden sparkles! It was very beautiful and definitely worth getting up to see. After this, we went back to bed for a couple of hours (Those beds really are comfortable!) and eventually made our way to a nice morning in the Sun in the Solarium. We had a great spot right at the pool. Around 12:30 pm, we went back to the cabin and got cleaned up for our lunch in the main dining room. They now feature a 30-minute lunch in there! This was great in that we weren’t spending hours in the main dining room at lunchtime as we’ve experienced in the past. 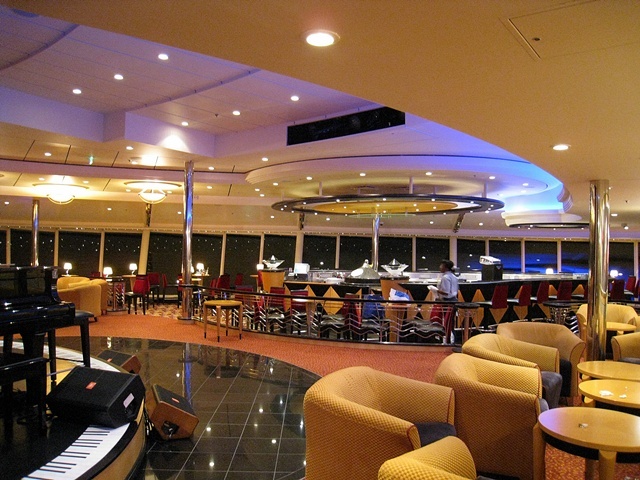 Saturday, May 3rd: Well, here was another cruise where we had a flight that was later in the afternoon… so we weren’t in any great rush to disembark from the ship. We sat with Dad and Pat and Mac in the Egyptian lounge forward, which served as the private departure lounge for Platinum, Diamond and Diamond Plus members. We snacked on sweet rolls and orange juice and listened as luggage tag colors were announced and watched people hustle and bustle out of the ship. Dad and Pat and Mac were driving as they live on Florida’s gulf coast, but they hung out with us for some time. They had a three to four hour drive ahead of them, so it was understandable that they needed to get going. A little while after our color was called, we stepped out of the lounge and went down a level to the hallway leading out of the ship. There was a pause here as the ship was conducting a mandatory emergency drill for the crew only. 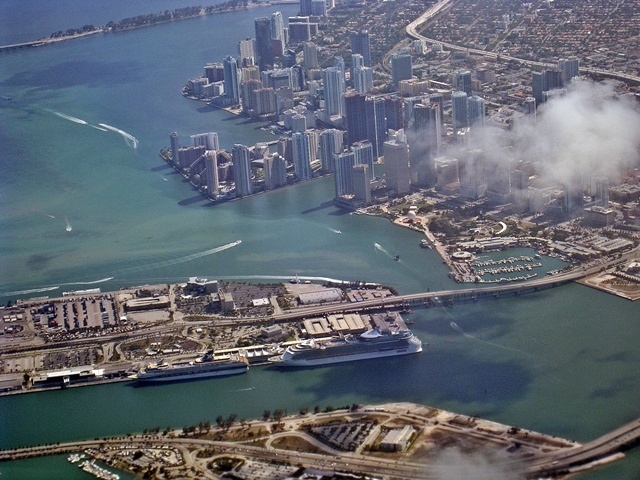 Once we got off the ship, we got through customs pretty quickly, got our luggage and got a taxi over to Miami International. We were at the airport by noon. After a pizza lunch we met up with the girls from work. Nanette was flying home to Texas, and Kathy and Linda were on the same flight back to Philly as Diane and I. The flight back gave us one last glimpse of Liberty in port, and I got an incredible shot of her from there. Conclusion: This was an excellent cruise aboard a gorgeous ship. We enjoyed the Concierge club just about every night before dinner. We had wonderful dinners at Portofinos and Chops Grille with Pat and Mac and Dad. We had great times hanging out with “The Girls” (Kathy, Nanette and Linda) in the disco and the other clubs aboard. We had excellent drinks in the Viking Crown lounge! Although the Liberty and Freedom of the Seas are sister ships, I have to say that overall, the Liberty was a much more satisfying cruise experience than the Freedom. So, if I were to choose between the two, I'd have to say the Liberty would be my first choice. I will away treasure this trip as one of my favorite cruises ever.